Even though spring training is right around the corner, we continue to hear rumors about Cleveland Indians ace Corey Kluber. While they’re admittedly quieting down, updates are still coming in regarding Cleveland’s talks with teams interested in trading for the two-time Cy Young Award winner. At the moment, odds favor Kluber staying put. It just doesn’t sound like the Indians are getting offers for him which they view as fair, despite the fact they’ve made a concerted effort to advertise his availability. While some may see Cleveland keeping its ace as good news, it definitely comes with some concerns. Beyond the Indians’ roster holes – which could’ve been addressed in a Kluber trade – the team may also need to worry about the severe level of awkwardness it’s about to deal with. Simply put, the Indians spent the past few months aggressively shopping their best pitcher and failing to move him, which could make for an uncomfortable reunion when he makes his way to spring training. There are some obvious caveats you can bring up here. For one, any trade rumors can be dismissed as “it’s just business.” Ask Jason Kipnis, who’s seen his name tossed around the rumor mill for the past few winters. Secondly, Kluber is essentially the poster-child for professionalism. The next time we read a story about him causing even the slightest issue in the clubhouse will be the first. With that said, this situation feels unique. Remember, this wasn’t a scenario where a team kept calling Cleveland to check on Kluber’s availability, leaking said interest to the media to get a story going. This isn’t being made awkward by reports claiming the Indians were considering a trade. No, this is an instance of Cleveland putting an intensive effort towards moving Kluber for the better part of the last three months. While the team obviously wasn’t going to deal him away for peanuts, it was still being considerably aggressive in shopping him. At one point, soon after the Indians moved Edwin Encarnacion, some pundits downright guaranteed Kluber wouldn’t be on the roster come Opening Day. As you can see, a little damage control may be required here. The Indians spent the entire winter intimating a trade of a starter was the only way they could sensibly upgrade their roster, and they failed to get one done. Kluber returns to the Indians not because they reconsidered making him available, but because they couldn’t find a deal despite talking with numerous teams. Assuming things will be fine because Kluber isn’t one to make a fuss would definitely be risky. Making things a bit more complicated is the corner the team painted itself into with thanks to recent comments about the offseason. Knowing this, if the Indians underwhelm in the season ahead, in part because their weakened offense can’t score runs, does that create an issue in the clubhouse? 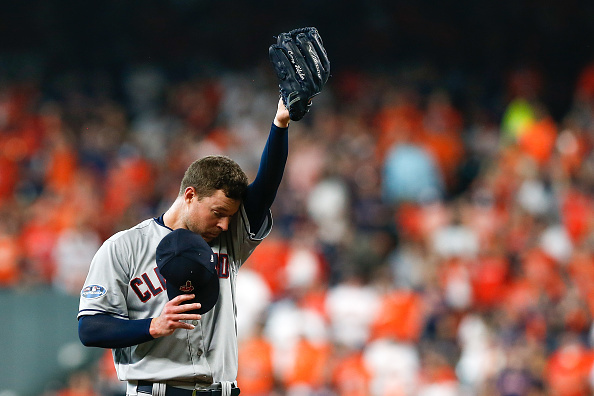 What if the struggles Kluber displayed last postseason follow him into the 2019 campaign? Will resentment begin to build if teammates are watching their ace show signs of decline, especially knowing the team could’ve upgraded the offense if it would’ve moved him over the winter? Suddenly, the Indians find themselves in a situation where issues are created both by their continued shopping of Kluber, as well as their inability to actually get a deal done. Obviously, this last bit is a little doomsayer. As mentioned, Kluber is hardly someone who’ll become a lightning rod for criticism. That said, this could be an added wrinkle if Cleveland struggles to meet the World Series contender expectations the front office is still setting despite a winter of cost-cutting. As for smoothing things over with the player himself, the Indians could spin the Kluber rumors by telling him “you’re so valuable to us that we weren’t accepting anything less than a haul if we were going to move you.” It’s not a leap to think this is all it’ll take to put a winter of trade rumors in the rear view. Again, though, this wasn’t a situation of teams trying to pry Kluber loose. It was Cleveland actively creating the opportunity for them to do so. As a result, eliminating any hard feelings which may come from this should be a top priority heading into spring training.